Hosted Web Store – As part of your website we also host your ecommerce system. This allows you to store and report on your ecommerce transactions. If you have a large product database we recommend you consider our dedicated server to ensure top performance and an excellent customer experience. Product Management Tool – Updating prices, product images, product descriptions, item numbers, shipping and other important information about your website products is very important. The Cazbah ecommerce system allows you do this with an easy to use tool. As part of the Cazbah Advanced and Ultimate programs your dedicated Internet Marketing Consultant will assist you when you need to make updates to your product database. Merchant Gateway Integration – Your merchant gateway allows you perform secure PCI DSS compliant credit card transactions. It is important for you to provide a shopping experience that protects your customer’s credit cards from being stolen. The shopping cart technology and merchant gateway integration allows your customers to shop with confidence know that their credit card information is secure. For the best credit card rates and customer service we recommend using our credit card processing partner First Capital Payments. Shipping Integration – Getting shipping costs right can be the difference between making money or losing money on an online transaction. Our shipping modules allow you to provide real-time shipping quotes for each transaction. Our modules support UPS, FedEx, and USPS. Tax Charts – With all the potential sales tax changes in our future it is important to have an ecommerce system that can adapt to those changes. Right now the sales tax nexus defines tax collection happening when your business has a connection or presence in a particular state. The Cazbah ecommerce system allows you to charge taxes state level down to the zip-code by simply checking a box. The system also maintains automatic updates to the tax charts so you are always charging the right amount of taxes on your transactions. 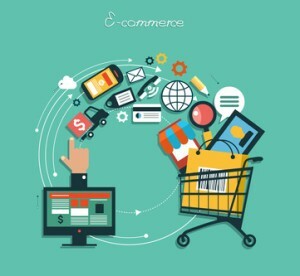 Shopping Cart – The typical shopping cart abandonment rate for online retail stores is 60%. If your shopping cart is hard to understand, too many steps, or doesn’t function properly you can expect that to go a lot higher. The Cazbah eCommerce shopping cart is designed to be approximately three easy steps. Cart – Address/Shipping – Payment. Keep it simple and efficient to get the highest conversions for your online sales. Visibility – Internet Marketing – Once you have a fully functional eCommerce website it is time to give that site visibility on the internet. That is where Search Engine Optimization, and Internet Marketing come into play. Use the powerful SEO tools that come with your Cazbah website or work with your Cazbah Internet Marketing consultant to give your site the maximum visibility with the right customers to increase your online and offline sales. Your old website is driving prospects and customers away, instead of attracting them. You need to invest in modern website design elements on your website if you if you want to make it long term as a small business. Are you a small business farmer who’s yet to jump on the digital marketing train? Modern digital marketing practices are what small farmers can rely on to remain relevant in today’s economy. Today I want to talk about how you can start taking steps towards building your business brand identity to last. If you’re a business just starting out or you’re looking to refresh your image, keep reading! We’ve got some tips and best practices you may not have thought about. Do you want to know how to generate more leads from your website? With that in mind, here are four best ways to optimize your small business website for lead generation and the number #1 best way to track those lead conversions. Pinterest isn’t new to the social media scene, but many small retail businesses are still undecided if using Pinterest for small business marketing is worth the effort. That’s a fair question and it’s definitely a question you should be asking. Pinterest could be the social media platform you’ve been looking for to marketing your small retail business! Your old, long web forms are costing you leads! Simple forms get more conversions. Keep reading to learn some online form design best practices and tips, so you can create more effective online forms for your small business website! What’s your small business value proposition? If you don’t know what’s special about your small manufacturing business and you don’t proudly declare and market that “thing” on your website, your business won’t be able to grow. Google AdWords works for small business! AdWords increases a small business’ ability to rank well, gain web traffic, target specific searchers and so much more! In this article, I’ll give you four reasons why Google AdWords works for small businesses and then some tips to help you start! I’m going to share with you how you can leverage small business blog guest posting as a specialty manufacturer to drive more traffic to your specialty, small business today!